After 9/11, dramatic changes to the port infrastructure of the United States took place. At one time, most ports were wide open campuses of commerce. But gradually, they have become highly secure gates on the front lines of the economy with highly integrated access, surveillance and critical communications technology. Georgia Port Authority (GPA) prides itself on being ahead of the curve. Georgia’s deep water ports are critical to the region and the country, accounting for more than 350,000 jobs, $66.9 billion in revenue and $18.5 billion in income. 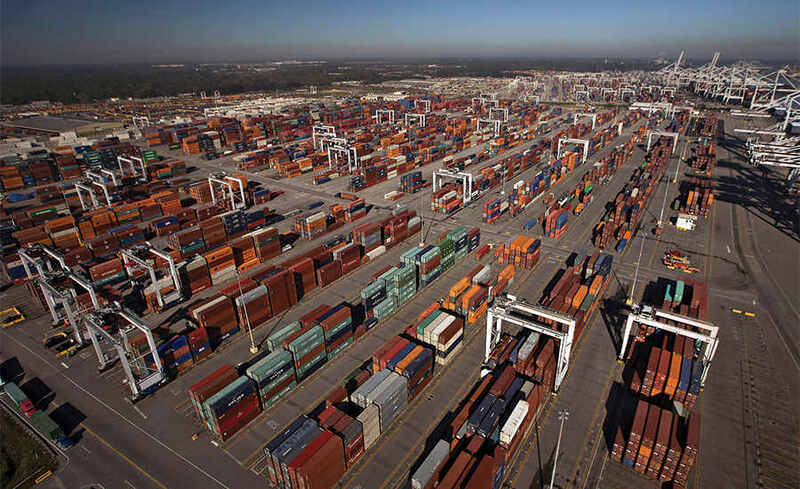 GPA operates four ocean terminals — two in the Port of Savannah and two in the Port of Brunswick — and is committed to maintaining a competitive edge through the development of leading-edge technology and operations to move cargo faster. The GPA continuously studies what must be done to sustain growth, performance and security. Remote Technology, a site security technology installation and integration company, has been supporting the port’s security expansion for a number of years. 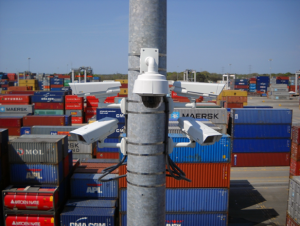 This focus led to the integration of access control, video surveillance, intrusion detection, monitoring and critical communications within the port infrastructure. 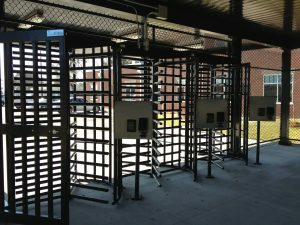 “Even though network devices have become interwoven with physical security, gates and turnstiles are still the backbone of any access control system,” Eskew said. Ports must also follow strict Transportation Worker Identification Credential (TWIC) standards as required by the Maritime Transportation Security Act. This act requires workers needing access to secure areas to maritime facilities and vessels to carry a TSA-issued TWIC. GPA has been an AMAG Technology customer since 2003, and recently upgraded its access control system to Symmetry Homeland Security Edition v8. Symmetry integrates with TWIC and HID’s pivCLASS Registration Engine and Certificate Manager to verify individuals needing access to GPA’s ports and terminals. However, GPA took it one step further and installed Techsphere Hand Vascular Pattern Recognition (HVPR) biometric readers at critical entry points. When the TWIC is presented and an enrolled hand vascular pattern is read, the information is validated against the HID pivCLASS Certificate Manager, which communicates with external trust authorities, revalidates the status of digital certificates and updates Symmetry with any change in status. The HVPR biometric solution is classified by TSA as an operational biometric, as described in the recently released final TWIC Reader Rule, which allows alternate (not fingerprint) vascular biometrics to be used where TWIC workers would have difficulty with fingerprint failures due to the work environment resulting in dirt/contaminants/scars on the worker’s fingers. “The reason vascular patterns are so successful in environments like GPA is the vascular pattern is extracted using a near-infrared camera from below the surface of the skin on the back of the hand,” explained Terry Wheeler, president of Techsphere. “GPA is the only operating port in the country successfully using TWIC and biometric readers at all unmanned entry points and private vehicle entries,” Eskew added. When the Department of Homeland Security learned how GPA uses Symmetry Access Control integrated with TWIC for all entry points and a biometric reader at MARSEC entrances, they were amazed, Eskew said. Two cameras record all transactions at each entry point, and Vingtor-Stentofon’s Turbine IP intercom system is connected to the Security Operations Center (SOC) enabling audio communication to verify someone at the entry point if the TWIC fails. “As we began to work with GPA we realized their existing intercom did not have the capability to meet the evolving needs of the port,” Eskew said. “In particular, the sound clarity and quality was not up to par and they had severe limitation on their IP scalability. As well, we needed assurance that the IP intercom would be fully integrated with AMAG as it evolved its technology. “We were impressed by the Turbine IP intercom system, specifically its noise cancelling technology, robust IP capabilities and its integration with AMAG,” Eskew added. Eskew sees the port continuing to be a leader in mitigating risk through security technology while always looking to optimize the business of the port. “We believe we are uniquely positioned to continue to help them with this through our knowledge of networks and security technology like AMAG and Zenitel. Facing high levels of traffic congestion, authorities in the city of Warsaw, Poland — population 2.6 million — are investing in major ITS infrastructural changes, such as for public transportation, road infrastructure and on and off street parking. To improve parking in the streets of Warsaw, the Polish company Comarch was selected by the city of Warsaw to introduce a smart parking platform. The technology behind this solution is based on Comarch’s Smart Parking system and a mobile application for inhabitants and visitors. This enables the system to collect information on the occupancy and vacancy of parking spots and to inform drivers in real time about the number of available parking spaces including navigation to the suggested available parking spot. As a part of this project, Nedap’s smart parking sensor systems SENSIT were implemented to cover the parking spaces at the Plac Konstytucji, the major square in the Śródmieście district of Warsaw. This vehicle detection system consists of wireless bay-mounted sensors that detect in real-time whether or not a single parking bay is occupied and how long it has been occupied. Texas-based insurance provider La Familia Insurance selected the IDIS Total Solution for 25 office and storefront locations as a key element of recent expansion efforts. With plans to establish additional offices in 2017, La Familia faced new security challenges over the course of its rapid growth, and experienced inadequate results from budget video surveillance options. The ability to monitor each office from a central location was a primary requirement for the business’ new video surveillance solution. IDIS, in partnership with Kratos Public Safety & Security Solutions, met this requirement with a solution that is both backward-compatible and scalable.